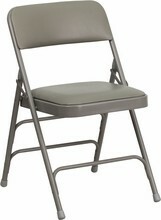 The Flash Furniture HA-MC309AV-GY-GG HERCULES Series Curved Triple Braced and Double Hinged Gray Vinyl Metal Folding Chair makes it easy to set up a large event hall. With its simple to fold design, this chair is easy to store and transport while its soft padded seat and back make it comfortable enough to sit in for extended periods. In addition, its feet are equipped with non-marring glides to protect the floor from scratch marks while its gray color makes it suitable for any event or function. This chair is constructed with a triple braced 18 gauge steel frame with riveted steel components, so it offers outstanding durability and has a weight capacity of 300 lbs. Featuring vinyl upholstery, it is easy to clean and will not get torn or scratched from frequent use.